'Rajma Chawal' will have a worldwide Netflix release on November 30, 2018, following its Asia premiere at the Jio MAMI Mumbai Film Festival with Star. What does ‘Rajma Chawal’ mean for the film and to you? The film is mainly about the rapidly changing communication gap between the generations told through a father-son drama, in which the popular North Indian dish rajma chawal has a timeless emotional quality attached to it. This dish features as a very important story thread. It’s also my favourite food, so I’m happy making a film with that name! The film is about people’s connection to a place, in particular, Chandni Chowk in Old Delhi. Do you share this nostalgia and can you define it? Places where you spend different phases of your life become witness to your story at that point in time. And yes, I do share this nostalgia about Delhi especially. I spent my college days in Delhi and there are certain places which bring back a flood of memories the moment you visit it. At any point in life, you revisit these places and it transports you back into the past, to the time which is relevant to that place. And Chandni Chowk is a part of Delhi that has a timeless quality — a kind of time warp, like things, have always been a certain way and will continue to be. The popular North Indian dish ‘rajma chawal’ has a timeless emotional quality attached to it. This dish features as a very important story thread. It’s also my favourite food, so I’m happy making a film with that name! Could you tell us about the casting process? There’s no fixed casting process for me. But, like in any film, some characters are challenging to cast. For 'Rajma Chawal', I realised that there are two characters that are going to be difficult to find the right fit! The first was of the lead girl, Seher. After meeting and auditioning many actors I finally found the perfect Seher in Amyra Dastur. The other challenge was finding the perfect Baljeet, one of my favourite characters in the script. I must have seen the maximum auditions for this character. And then Aparshakti Khurana walked right into the role and created an amazing Baljeet in the film. How was the dynamic on set, between the very seasoned Rishi Kapoor and the two young actors Amyra Dastur and Anirudh Tanwar? The most enduring quality about Rishi Kapoor is that he never lets the child inside him fall back. He has this child-like ability to constantly adapt, not only as a person but also as an actor. He was really generous with Amyra and Anirudh on set. And both the young actors stood their ground with extreme sincerity. And then, we always had rajma chawal and tasty food to bridge any gap on set. Food was a source of great bonding during the entire shoot. "The most enduring quality about Rishi Kapoor is that he never lets the child inside him fall back. He has this child-like ability to constantly adapt, not only as a person but also as an actor"
Surprisingly, most of the older people in the film are adept at using smartphones and technology, albeit in their own peculiar way. Is this unique to Old Delhi’s culture? I think technology as of today has seeped into places we can’t even imagine. In the remotest villages, people are watching all kinds of content on their smartphones. So this introduction of technology is unique in its own way, not only in Old Delhi but anywhere in the world today. But yes, in Old Delhi the juxtaposition of technology with the old structures and lanes makes for some interesting visuals. What led you to change gear from a fantasy elegy like ‘Parched’ to something so different and seeped in the very real world of Delhi? I wanted a change. To challenge myself as a filmmaker, I wanted to explore a completely new territory, a new space emotionally and also content-wise. I wanted to find new aspects of story-telling and the best way to do that is to change the genre, which also helps you explore a newer side of yourself. 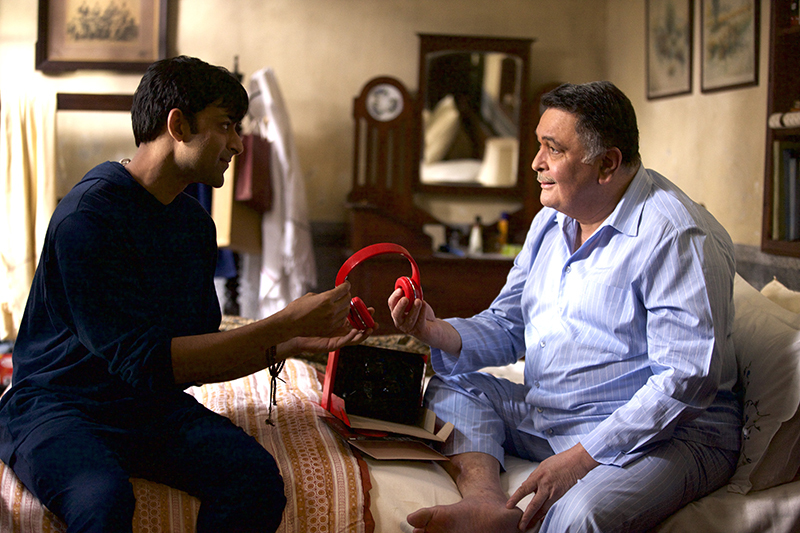 During the film’s climax, Rishi Kapoor confesses to his son that he never learnt how to express love. Is this a cultural ramification in India, particularly for men? I cannot make a generalisation about this as it is at one level a very individual thing. Expression of feelings is something we learn at a young age. If we are surrounded by expressive parents and friends, we often become expressive. Culturally in India, men are taught to be ‘tough’ and to hold back on the feelings front. This becomes a burden not just on their relationships but also for them individually. And now technology is another barrier in that expression. We live in challenging times where connectivity is better than ever before, but also there is a growing sense of isolation and loneliness. Personal interaction and exchanges cannot be replaced by a machine always. Emotions are much more powerful than emoticons! ‘Rajma Chawal’ is a hopeful film, wherein both generations reach across their gap to overcome it. Do you think this is rare in our lives, if yes, what holds us back? I think each generation blames either the previous or the next one for the world falling apart. And now technology is a big factor in the changing times. If each generation was able to look at the other and learn from them, it would be ideal. We have tried to address this in 'Rajma Chawal' — the fact that no one is right. The two generations indeed have a lot to learn from each other. Do you have your next project in mind already? I’m looking forward to venturing out on a new journey — in a new zone — hopefully very soon. "Emotions are much more powerful than emoticons!"